July | 2012 | eating with S.O.L.E. Caprese ensalanda is my favorite Italian starter… and baby buffalo bocchini’s call to me. 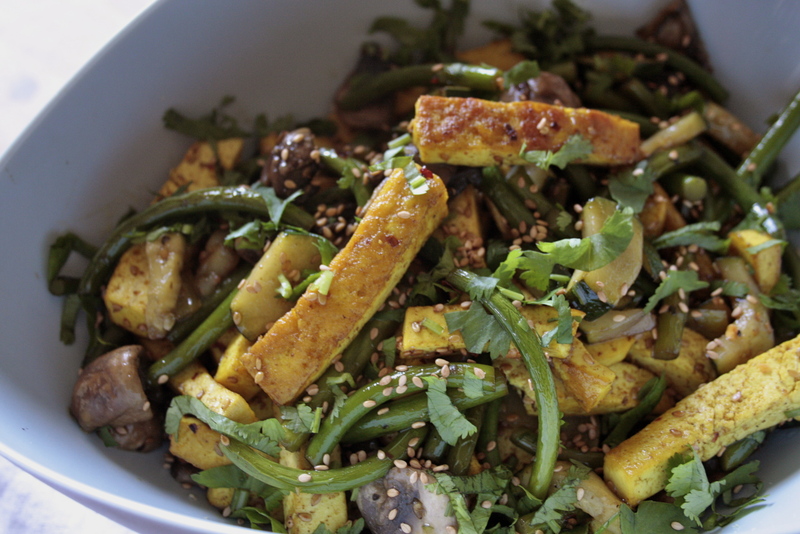 This salad is a warm spin on my favorite. Made with oven roasted fresh local tomatoes, ribbons of basil from the garden and pillowy soft bocichinni with quinoa and a drizzle of olive oil and balsamic. Perfection. I started with about 8 small fresh tomatoes, cut into 8 pieces each, tossed in a generous amount of olive oil, sea salt and balsamic vinegar, along with a sprinkle of dried parsley. Roast at 425 for about 40 minutes, or until nicely roasted. 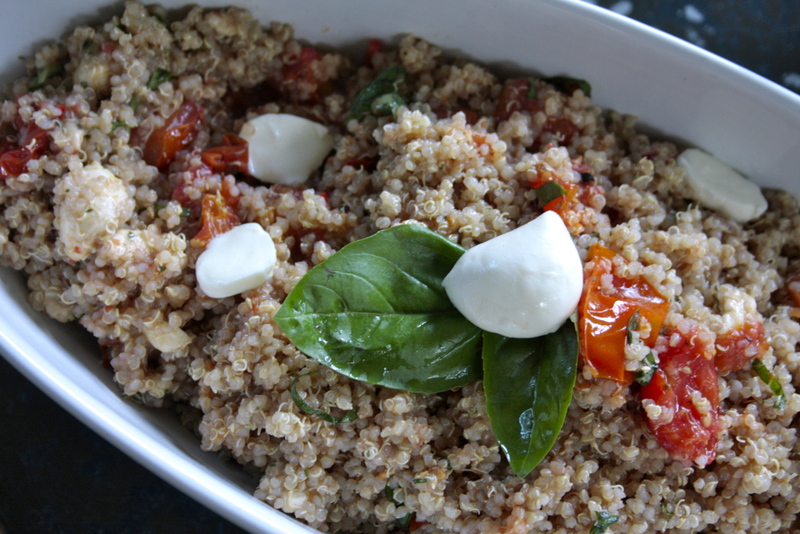 In a separate bowl combine 4 cups of cooked quinoa with 1 cup of sliced bocchini cheese. Set aside to soak up the flavor while the tomatoes roast. Once the tomatoes are done to your liking add them to the quinoa along with all the roasting juices, gently toss and serve. I am back on the granola train these days… and was getting a little fed up with breaking the bank on granola purchases when I knew making it was super easy! 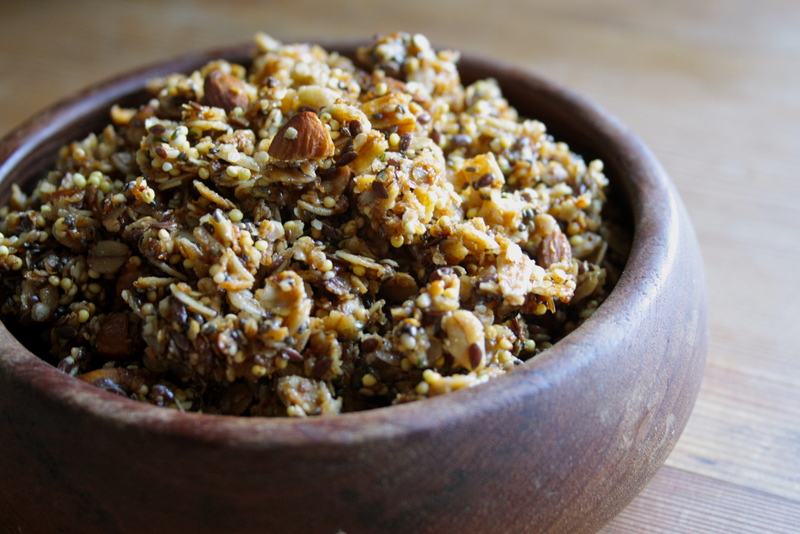 Also I just stocked up on some good organic bulk grains and thought it was about time I busted open some brown bags and got granola toasting. So glad I did. Stir often and after about 5 minutes of boiling remove from heat and pour over dry ingredients. Stir in until well coated then pour granola onto two parchment lined baking sheets and bake at 300 for about 20 minutes or until golden brown. Cool and store in large air tight jars! Enjoy. Wow it’s like the food bomb just went off this week! 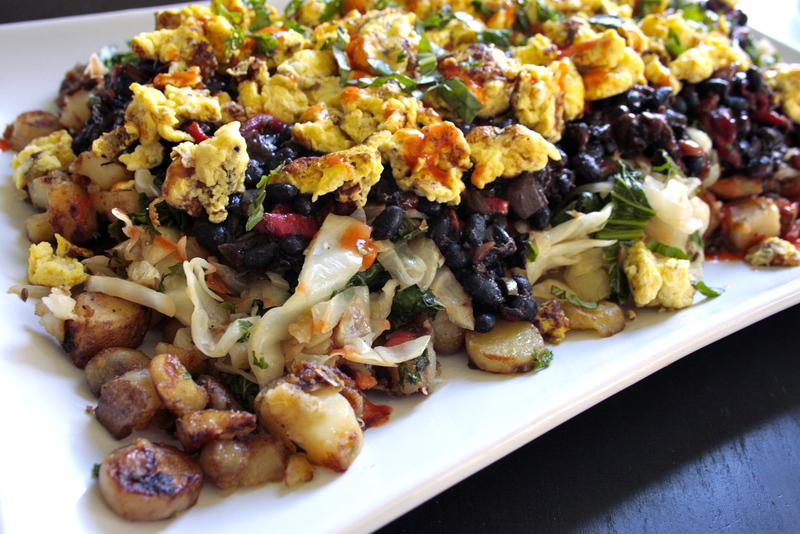 Suddenly there is food everywhere… wild harvests abound! We have been picking saskatoon berries, cherries, strawberries, mint, and even cat tails have been collected by the dozens for both winter basket weaving and we have been eating the starchy crunchy sweet tender roots in all manners of preparation. 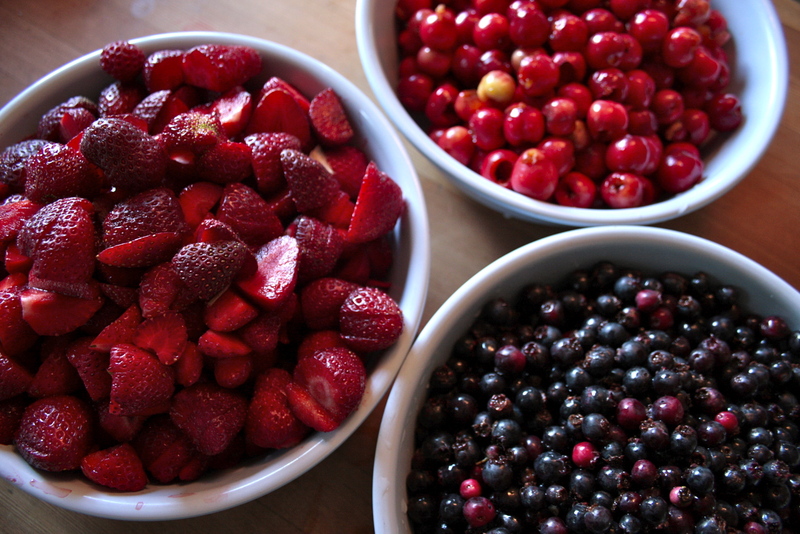 I was so flush in fact with free berries yesterday I had to get baking even though the heat was intense! I settled on making a couple batches of my favorite spelt cream cheese puff pastry, and busted out 2 extra large and 9 mini triple berrie tarts. We had friends for dinner who brought a lovely almond flour strawberry cake, and for dessert we had a trio of berry celebrations including: a slice of my berry tart, a slice of her strawberry cake, and a scoop of vanilla frozen yogurt slathered in saskatoon strawberry syrup I bubbled up! 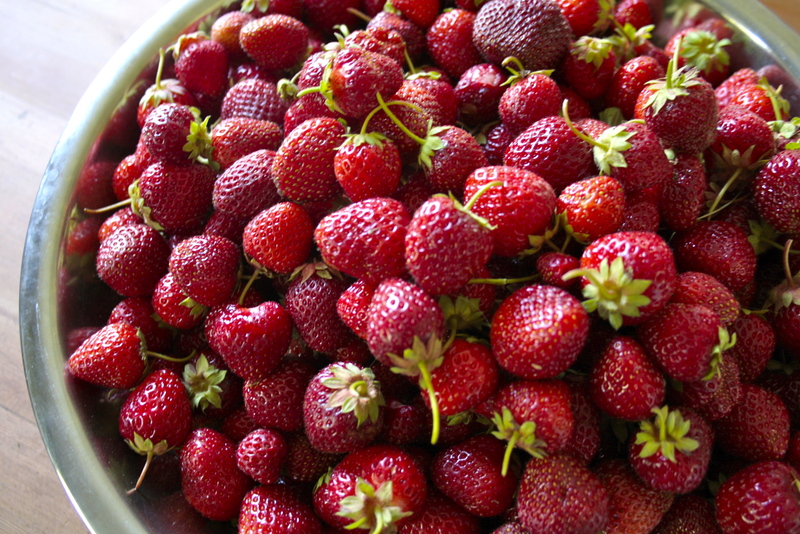 Over the course of the day I must have eaten a pound of fresh sun warmed strawberries even before dessert was served! 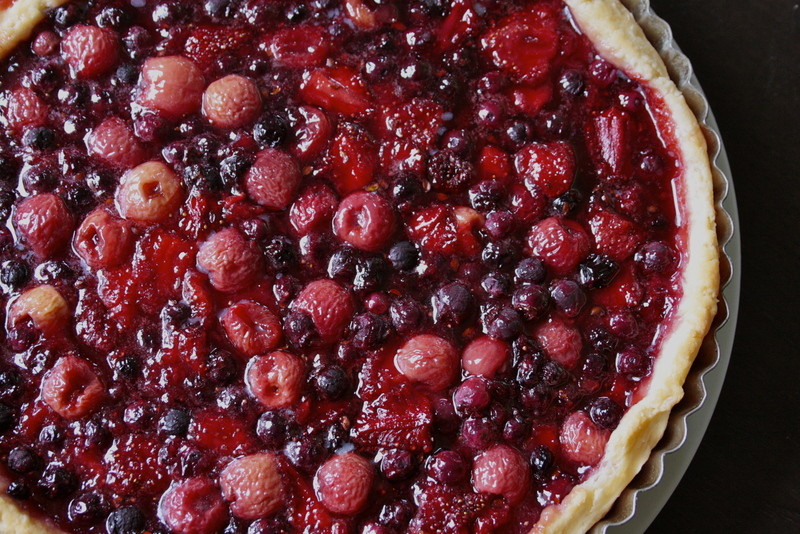 So today I am sharing my easy quick berry berry pie filling recipe, which was divine with this no fail spelt puff pastry, but would be ideal in a classic pie crust too, even drizzled over ice cream or granola or yogurt, or even canned as a fruit topping! As I said this batch yielded a HUGE amount of filling so if you are wanting to do just one pie cut it by 1/3! But I will share the recipe as I made it which would get you through at least 3 pies. Stir sugar into fruit and allow to boil for about 5 minutes before turning off heat and allowing fruit to cool slowly. Use this fruit filling as you see fit and you will certainly enjoy it! I had the great pleasure of fishing last weekend with a master fisherman on my favorite lake in the world. We had a great day with lots of bites and we came home with 10 fine fish; 2 Dolly Vardens, 5 Rainbows, and 3 Kokanee’s. 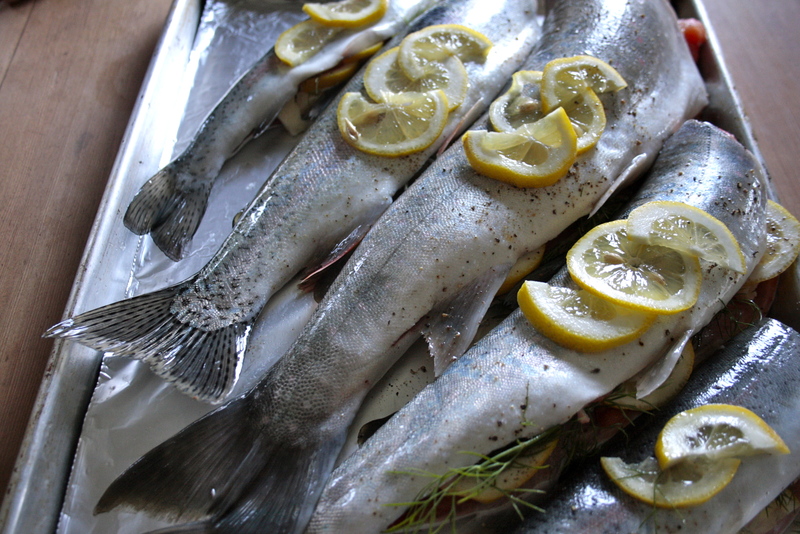 We invited some friends for dinner and enjoyed a great amount of fresh fish, cooked in the oven with great pads of butter, fresh dill from the garden, lemon wedges, garlic scapes, and a sprinkle of sea salt. Mmm what a perfect way to end a day in the boat, after soaking up the sun and swimming in crystal clear waters. Fish is a real celebration in our house, a meal which we rarely eat, and *never buy. Why? because the oceans are a total mess! Commercially prepared seafood is laden with scandal, toxins, mis-information, environmental catastrophe, species collapse, chem farming and now even radiation. So I use my fork to vote that these methods of bringing fish to the table are NOT for my family. 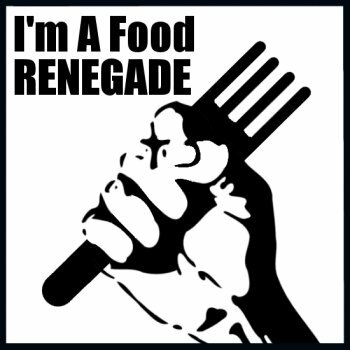 I am sure some of you think me radical, but why on earth would I serve my family un-safe un-healthy food that is ruining my childs future planet? I love fish, but we are sticking to eating it only on the rare occasion that we catch it ourselves (or does someone we know) right here in our very clear lakes. I have ranted about this here in the past (back in 2010): Fishy Business, but feel this issue is important and everyone ought to be aware of what they are eating, always. Now with the onset of radioactive fish and garbage crashing into our coastline it might be a good time to get a little more informed and make some educated decisions for the health of your family. The world isn’t a safe place, and frankly folks your local grocery store is among the most scary places around. We the consumers are expected to blindly believe that all of the endless-harvest all-seasonal all-animal abundance is packaged and safely managed using sophisticated technologies and ethical practices to bring to the shelves of these mega chain grocers everything our hearts desire everyday of the year at no cost to our planet, our bodies or our future! Geez, I am not buying it (literally). Come on folks, time to wake up and start making relationships with your food. Grow it, Raise it, Name it, or at least go and get to know the folks who are doing that all for you, because food is our medicine and our bodies are our temples, time to get smart. Stop trusting these multinational food chain mega corps to keep you nourished and safe, because all they care about is their bottom line. Like this rant? Here are some others you might enjoy: Rant about Safe Food, Whats going on here?, The Corn Conspiracy, Or check out my FOOD SAFETY + SUSTAINABILITY ISSUES Category. Another SOLE spun Tassajara recipe, that rocks! 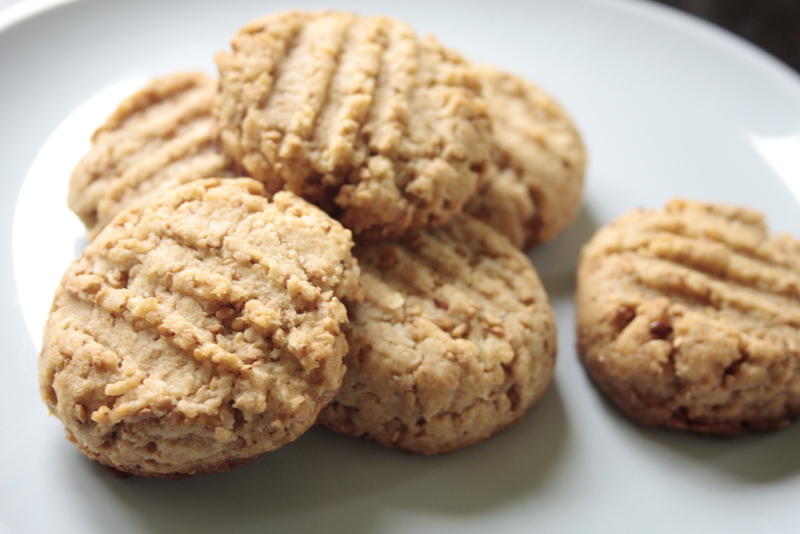 These nut free cookies taste just like peanut butter cookies, but they are way better. With rich creamy tahini and toasted sesame seeds they are a stunningly simple spelt flour cookie. One of our new interns here at the “farm” is allergic to peanuts so I figured what better time to try out this recipe! a pinch of fine sea salt. Portion into desired cookie size, and fork down. Then bake at 350 for about 20 minutes, or until golden brown.